The exterior of a home or business provides the first impression that anyone makes. Does your home look welcoming? Does your business feel professional? Or does your home look run down, your business careless? A new exterior paint job can work wonders and it can easily take your home or business from old and tired to new and dynamic. Let us bring out the beauty of the outside of your building. We can paint the outside of any residential or commercial building quickly and efficiently. We at Master Painters always choose our paint for its quality and longevity, because we take as much pride and care in painting your home or commercial building as we would if it were our own home. Plus we take the time to thoroughly and correctly prepare all exterior surfaces so that you will have a long-lasting high-quality paint job that you and your family or employees and customers can enjoy for many years to come. Exterior painting is not just about a building’s walls and doors. It is also about trim, but it is even about fences and decks. We can do it all. Contact us for an estimate. 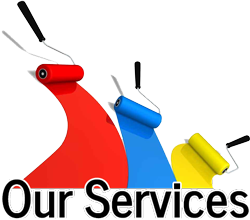 We do ask for some help from you before we begin to paint your building’s exterior. Here is what you can do to make your painting experience as good as possible, to speed up the process, and to minimize the disruptions to your daily routine. Be sure to trim back any landscaping in order to allow our painters close access to the siding and trim and all hard to reach areas. Make sure that all water spigots are in good working order for power washing. Make sure that all exterior electrical outlets work if we need them for any necessary power tools. Help us out by designating a safe area where the crew can leave their work equipment, which will include our ladders. We are trying to avoiding inconveniencing you during the process, and this will help both you and us tremendously. Make sure to coordinate your painting plans with any other tradespeople you may employ. Be sure to reschedule any lawn service and please turn off sprinklers while we are painting your house or commercial building. Finalize your color selection before the paint crew gets there. Be sure to close all of your windows on power washing days. Please be sure to unlock your front door and windows on the days they are painted. And finally, please remember that the front door must be open all day, and maybe part of the evening, on the day it is painted. Prepare to have your house secured in some other fashion. We will also perform our own preparations in order to ensure that painting your commercial building or home goes off without a hitch and results in the best possible outcome. Washing – we start off by washing the area. Any necessary areas of your building’s exterior will be power washed or hand washed (in those hard to reach places) in order to remove dirt and mildew. Preparing the surface – we want the final job to look its best. To that end, in order to properly prepare your home or commercial building’s exterior, we scrape off any loose paint, we scuff sand any glossy areas, and we make sure to caulk any gaps in order to prevent water intrusion. Painting – The next step is: your repaired and ready areas are primed. Then we apply premium-quality paint to your commercial building or home’s exterior. This expert process creates a uniform finish. Cleaning – by the end of every day on the job, and upon completion of your project, the painting crew will clean up around your home or commercial building. We will ensure that any paint chips are removed and that all materials are packed up and stored neatly away. Inspection – subsequent to our own inspection, the job site supervisor will walk you through the space. This will give you the opportunity to review our work and to provide any initial feedback. When your exterior building painting project has been finished, it will endure and look good for years to come. Once every year, check the caulk around windows, door frames, and the trim in order to ensure that nothing is cracked. In general, freshly applied caulk lasts about three to five years. If you have an area on the siding which is prone to mold, mildew, or salt, clean it frequently with a stiff brush and power wash with a solution that contains a bleach additive. We offer power washing service for those hard to reach areas, so contact us. Take care to remove birds or insect nests on your newly painted home or building. Contact a professional exterminating service if the insects are numerous or dangerous (such as wasps). Brick is rightfully celebrated for being low maintenance However, if your brick does not look good next to your freshly painted siding, it can potentially ruin the overall effect. Maintain your building’s brick work by clearing weep holes filled with debris and be sure to contact us to power wash it once per year. Cut away any vines growing on your home or office building in order to prevent damage and reduce humidity damage. Make sure to keep landscaping trimmed well in order to avoid possible damage from humidity. You can contact us in Jupiter or West Palm Beach by using the handy form on our website. Ask us about not just exterior painting, but also interior painting, power washing, ceiling replacements, and even our restoration services. At Master Painters, we want to be your exterior painters.